Knowlesys Information Center System provides a strategic information infrastructure for large companies and groups to facilitate information circulation within and outside companies and building the digital nervous system of the companies. As the economy grows, large companies and groups are facing more and more market complexities. New problems and situations that affect the market trend emerge one after another and market information multiplies. In the mean time, application of the quantitative method to the industry research at a high speed demands higher efficiency and accuracy of information collection. The mode of manual information collection has been unable to cater the market and technological growth. To know the market changes in a full, accurate and fast manner, to adapt to the new technological development and free people from onerous collection work to concentrate on in-depth study, a modern information center system is becoming an imperative. Knowlesys Information Center System aims to provide a platform for collecting external information to the marketing and PR departments of large companies and groups, including the information about the companies, their competitors, the industries, prices and their partners, various information posted online by users, and research and technical information. It allows a number of people to quickly access all related information at present or in the past on a single platform, avoids the heavy burden from manual search of multiple sites. Its alarm function allows the related people to be aware of the information as soon as it occurs. hundreds, thousands, even tens of thousands -�?453舆情4533�? unsatisfying, waste of human resource-�?453舆情4533�? Quickened awareness of external intelligence: external information is timely collected and presented on the desktop such as press releases about the company, customer feedbacks, competitive product news, industry news, macro trends, policies and legislations to facilitate everyone in the company to know and respond to the market competition intelligence. The network topology of Knowlesys Information Center System is shown below. It can be separately implemented in the Internet LAN and private LAN as needed. The information acquired can be text information (e.g. articles, microblogs), numeric information (e.g. prices, statistic data), or file information (e.g. Word, Excel, PDF files). Users can configure the acquisition of text information by themselves via Web interfaces, or the collection of numeric information via software wizard interfaces. With the world's leading Knowlesys Network Information Acquisition System, you can collect and integrate data on any website. Discovery and management of data sources are completed by users. 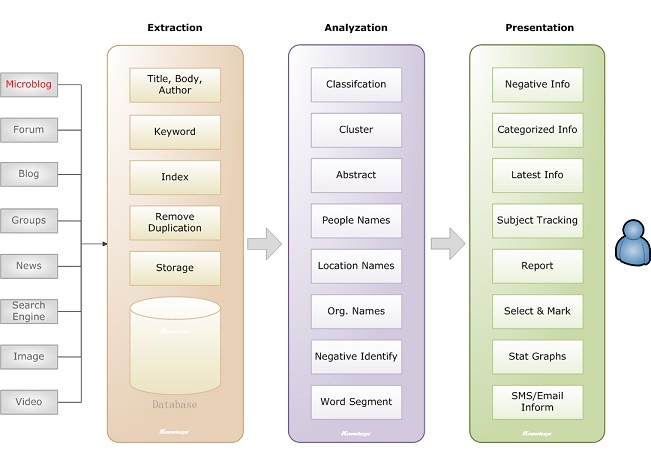 The content analysis sub-system extracts the meta-information of contents and automatically classifies and clusters the contents in real time based on the key words specified by users. The ultra-high speed key word extraction technology developed by Knowlesys can find the number of occurences of 10,000 key words in a 30,000 words article in no more than 6.9 ms. The collected information is viewed in form of list (for text information) or in the users' own formats (for numeric information). For posts on BBS, titles, texts, posting time, view counts, number of comments and poster IP addresses can be collected. The contents collected can be classified, filtered, added with notes and complied for subsequent management and analysis. In emergency or exceptional situations, information collected can be entered manually. Valuable information can be published onto specified platforms of private LANs or Internet LANs after being selected or classfied or exported in various formats (CSV, XML, Excel, Access) for further transfer. The system is mainly applied to the marketing and PR departments of large companies and groups. provide the acquisition configuration of N websites specified by users. Submit request, or contact us now.